Click the image below to view full brochure. There are a lot of temperatures to take in healthcare ranging from operating rooms to food service lines, and failure or inability to keep track is not an option. 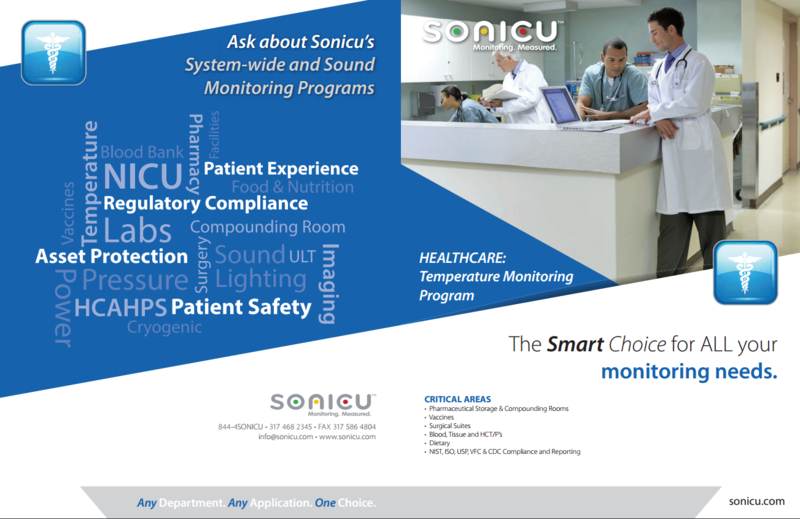 Sonicu's Temperature Monitoring Program provides a single-source solution that eliminates manual logging and reporting, ends uncertainty and improves accuracy, safety and accountability. Download our free Temperature Monitoring Program brochure to discover how one wireless monitoring platform meets and exceeds all temperature monitoring requirements and eliminates manual logging and reporting simply and accurately.